Federal Criminal Practice Blog — I just completed another Wordpress blog for a client of my good friend and associate, David Schiffer, of DLS Design. 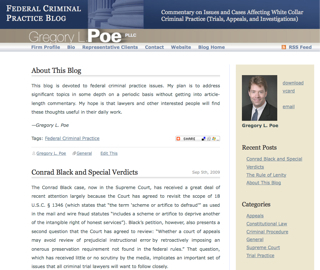 David built a beautiful, static site for Gregory Poe, a lawyer in federal criminal law practice. Humintell.com, a website project I worked on this past Spring for the Landsman Communications Group recently launched. Humintell is about Microexpression Analysis—the understanding of the underlying emotions of people by looking for universal facial expressions that flick on and off in less than a second. I built the Humintell website using Wordpress, modifying the Minimal theme to match the graphical design, typography and layout from graphic designer, Dean Meyers.